Sault Ste. Marie May 7, 2018 – If there’s one simple thing you can do for Mental Health Week (May 7-13), it’s join the 10,000 other Ontarians who’ve signed CMHA’s online petition urging political parties to fund mental health and addictions care like physical health care. Also the community is encouraged to take part in the many Mental Health events that are planned for the week. Monday, May 7th beginning at 1:00 pm we are walking for mental health to kick off Mental Health Week! This will mark the first Mood Walks of the spring season. 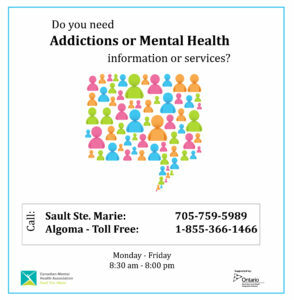 We will start at CMHA Sault Ste. Marie, 386 Queen Street East and walk Queen Street, sporting our green shirts tying green ribbons on the light posts. Refreshments will be served after the walk. AFS’s “The Sky’s the Limit” Concert at The Tech, 130 Wellington Street East is on Thursday, May 10th from 7:00 to 9:00. “The Sky’s the Limit” 3 on 3 Basketball Tournament at Sault College Health & Wellness Centre is Saturday, May 12th from 9:00 a.m. to 4:00 p.m.
To download a digital copy of this news release please click here.